We had spotted a Peregrine earlier on the ledge of the water tower next to the VA Hospital, but thought it was probably a parent, and we continued on to MacKay the check the fledgling's status after the strong thunder storm went through the UB area. After doing two rescues and returns to the roof, Mike Koch, DEC tech, confirmed two chicks on the roof, plus there was another on the nestbox perch. 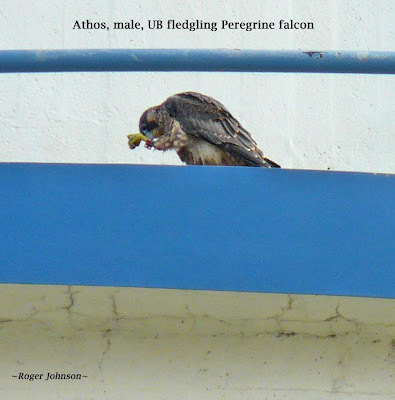 Athos, a fledge from June 23, was missing. Before leaving UB, we could still see the bird on the VA water tower. Suspicious, we drove over and saw the bird was a fledgling, not an adult! Roger got these shots. headed for MacKay! He flew off again and back again. The four birds weathered their first severe storm which roared through the area with very high winds, lightning, thunder and heavy rain.